On Saturday 28 May,six men in formation at Allen Hall Seminary were admitted as Candidates for Holy Orders by Archbishop George Stack, Archbishop of Cardiff, at a Mass of the Blessed Virgin Mary Queen and Mother of Mercy. The men admitted to Candidacy included Mark Dunglinson, Rajiv Michael and Jonathan Stogdon from the Diocese of Westminster, Joshua Hilton from the Diocese of Leeds, Robert James from the Diocese of Cardiff and Johnny Whitby-Smith from the Diocese of Nottingham. The celebration is a public statement of intent on the part of these men to go forward for Ordination. It is also an acceptance by the Church of this desire and a formal recognition of the journey towards Priesthood. May God bring to fulfilment in them the good work begun in their journey hitherto. Please keep these men in your prayers as they continue their journey towards Ordination. 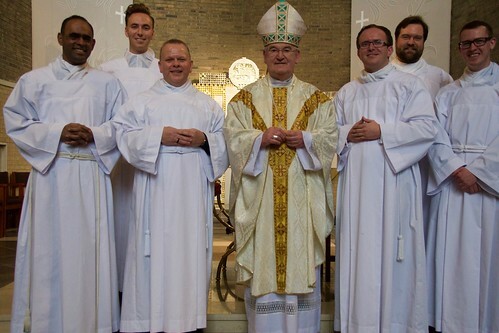 Photo: Pictured with Archbishop Stack from left to right are Rajiv Michael, Joshua Hilton, Mark Dunglinson, Robert James, Johnny Whitby-Smith and Jonathan Stogdon.